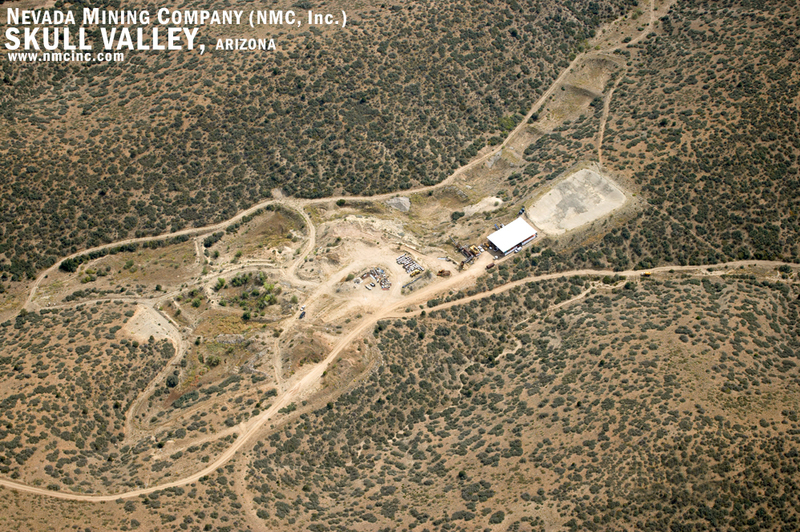 Skull Valley – NMC, Inc. 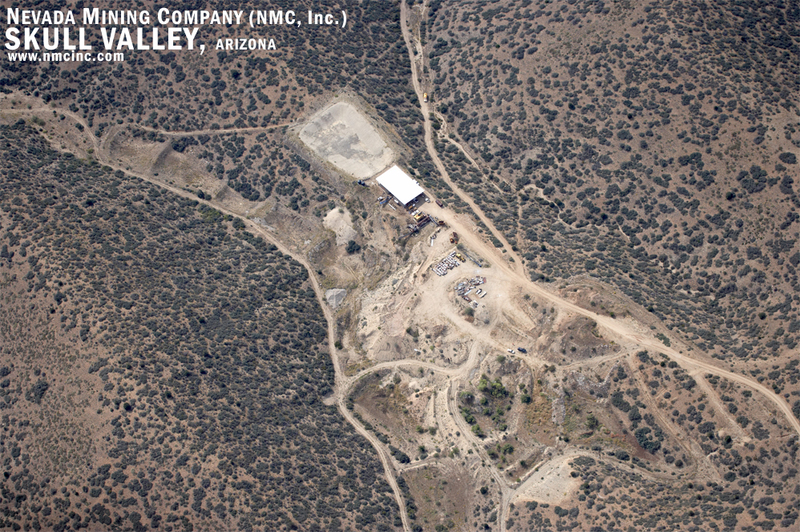 The site is approximately three miles east of Skull Valley via Copper Basin Road. 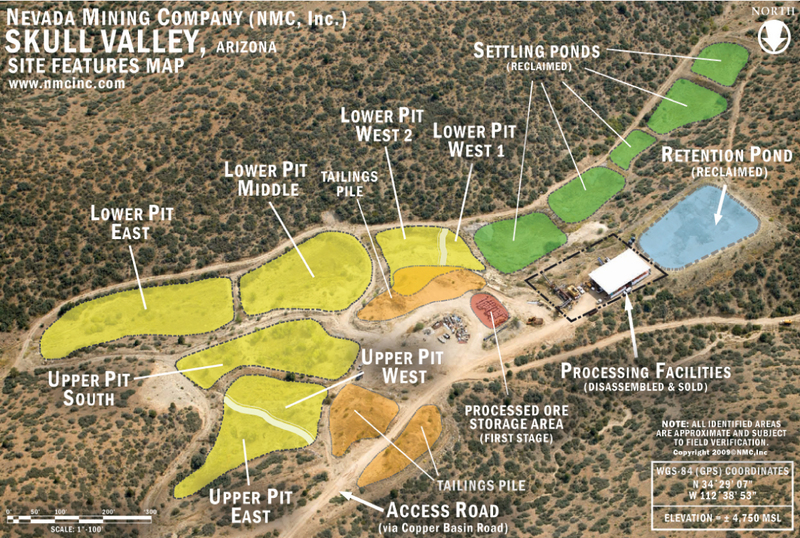 The project site is owned by the State of Arizona as Trust Land. 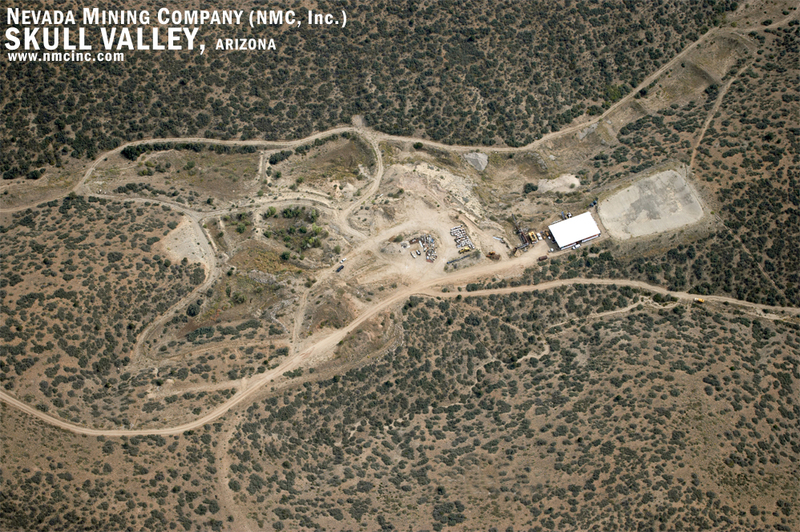 NMC, Inc currently has a 20 year Mineral Lease on the 377 acres that encompass the Skull Valley mining project. 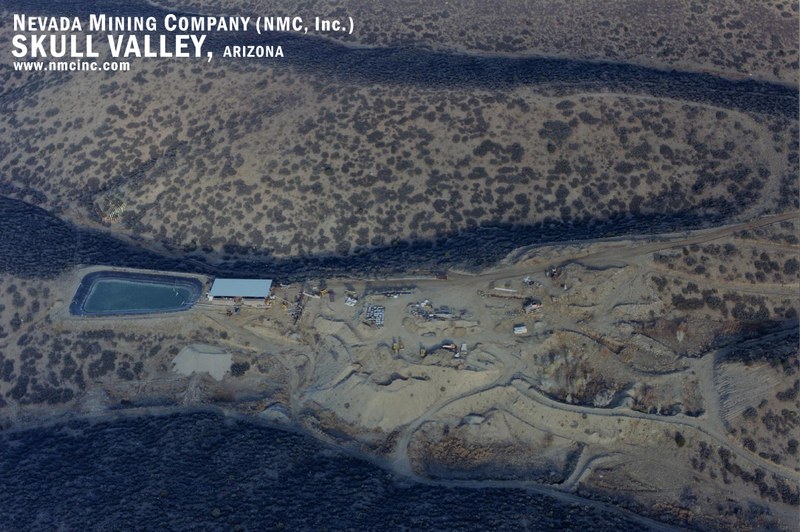 The lands adjoining the site are undeveloped lands used for grazing and are owned by the State of Arizona and Bureau of Land Management (BLM) except for the Phelps Dodge property now owned by Freeport McMorran Mining Company. The climate is typical of high (4800′) desert elevations. It is generally dry with moderate temperatures. The area is subject to high daytime temperatures in the summer (100°F) and freezing temperatures at night in the winter. Rainfall averages approximately 20–25 inches per year. The site is located on the western flanks of the Sierra Prieta Mountians. 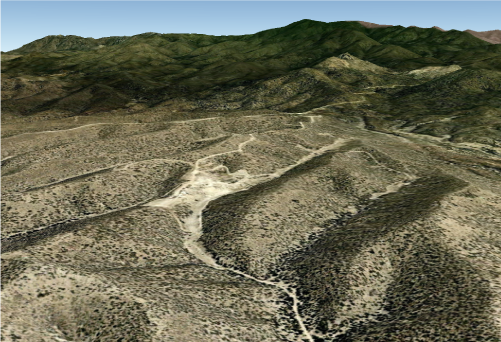 This small mountain range is the northern extension of the Bradshaw Mountains. These mountains consist of older schists and granodiorite, granodiorite porphyry, quartz diorite, amphibolite, aplite, and schist which have been intruded by younger granites and volcanic rocks. Precious metal bearing gravels derived from the higher eastern elevations occur on a granite pediment and in the arroyos. These Precambrian exposed rocks were intruded by the Laramide-age Copper Basin stock. Quartz monzonite, quartz latite porphyry, and several highly mineralized breccia pipes comprise the bulk of this composite stock. Late Tertiary rhyolite dikes and plugs are present in the southern and western parts of the district. 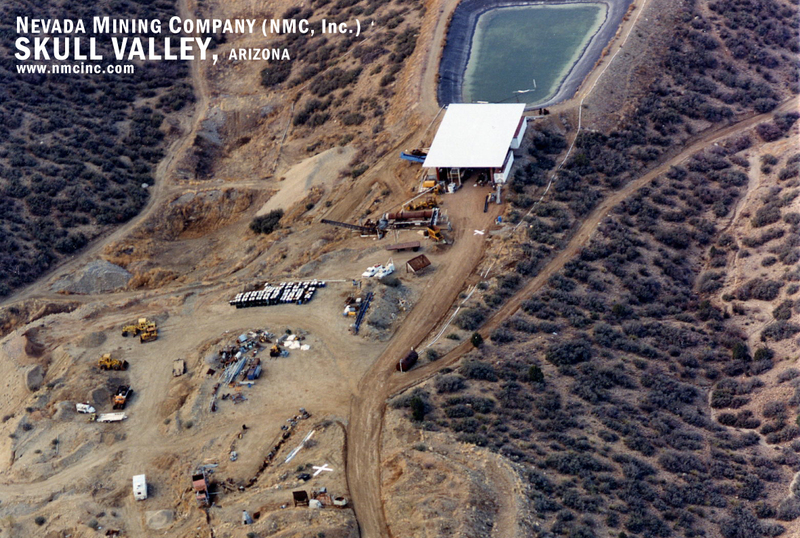 Most of the past producing mines are on patented lands owned by Phelps Dodge. 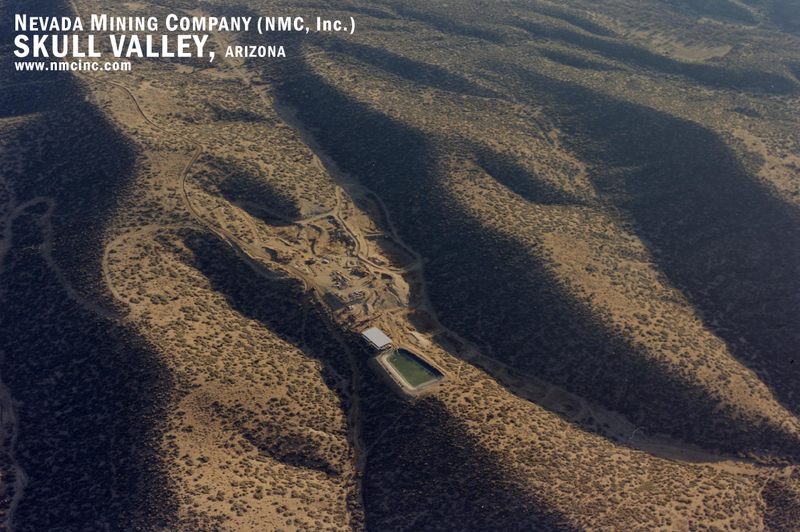 Some of the largest mines within this area are the Commercial, Copper Hill, Loma Prieta, Boston-Arizona, and U.S. Navy sites. 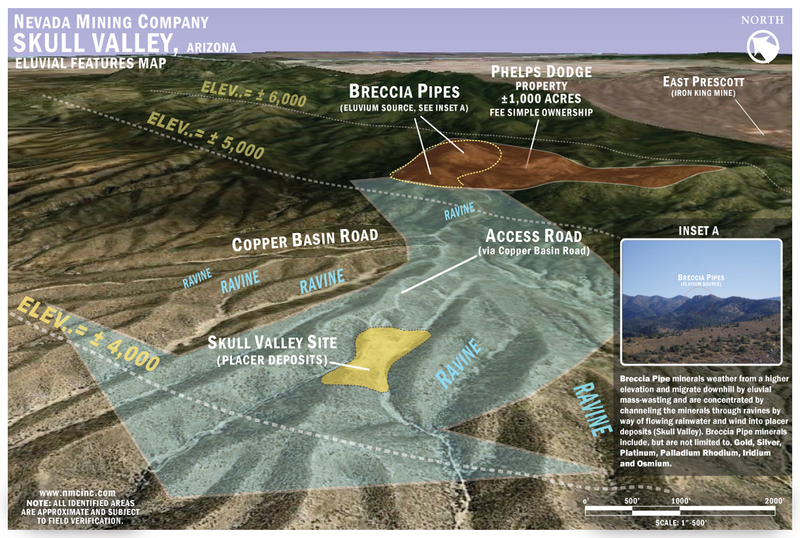 Most production has been from breccia pipes and peripheral vein deposits related to the Copper Basin stock. Soils range from 0 to 25 feet in thickness. Little or no soils are found on the pediment. From 1983 through 1994, free gold was extracted from head ore by the former operators. During this time, the fine sands were placed into holding ponds (pits) for future processing. 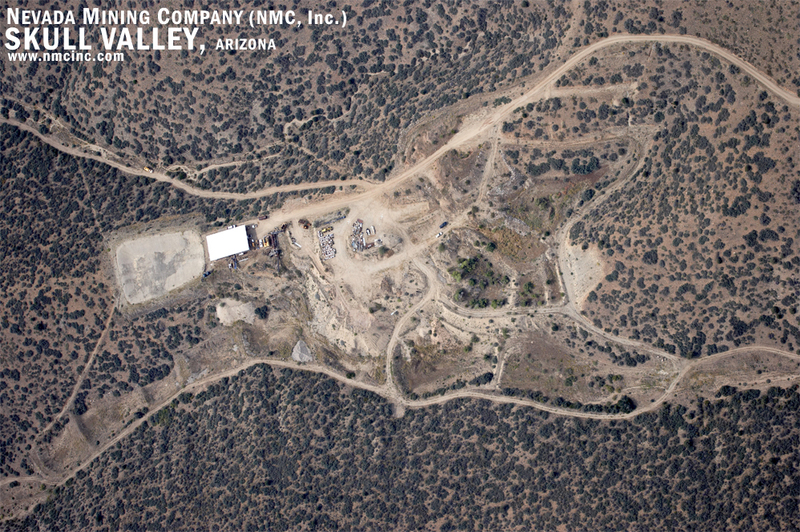 In August of 2007, the Company acquired the resources of Geosyntec Consultants of Pasadena, California in order to perform a geophysical survey to determine the amount of ore stored at Skull Valley. 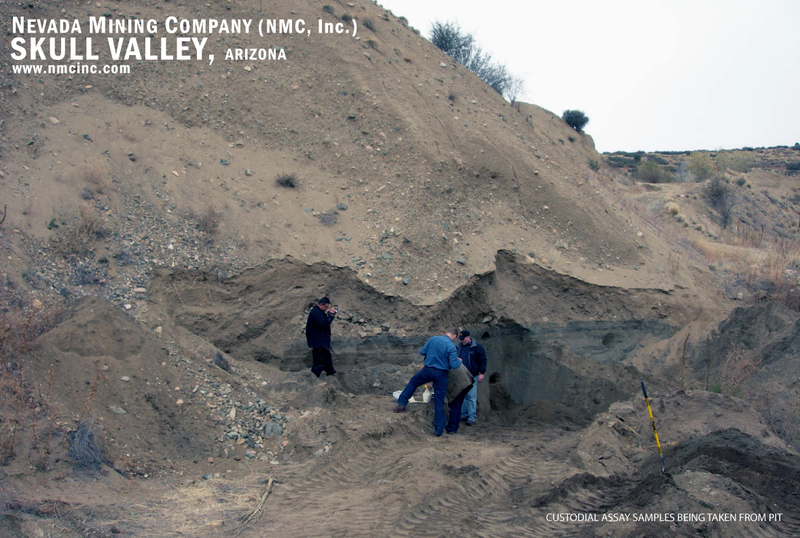 Geosyntec’s scope of work included review of existing aerial photographs and site assay reports and discussions with NMC personnel regarding the approximate locations and dimensions of the pits. This was followed by two-dimensional (2D) surface seismic tomography surveys to determine the dimensions of the storage pits. 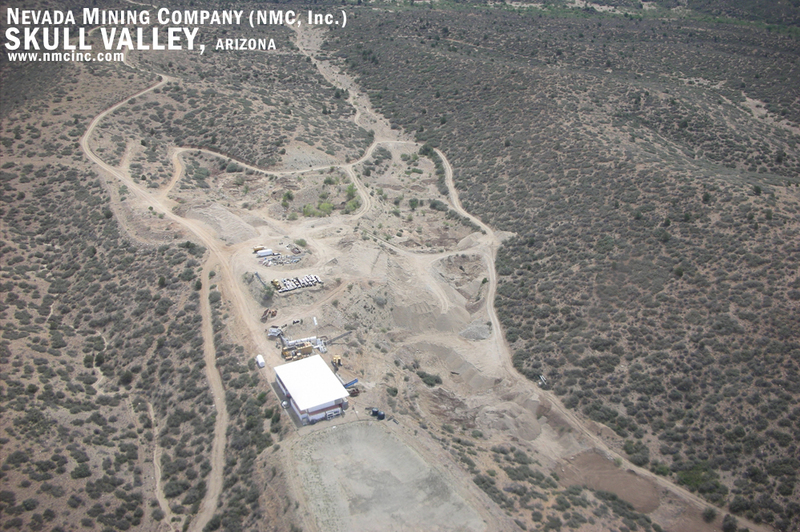 Pursuant to the scope of work defined above, Geosyntec reviewed available documents and aerial photographs of the site in preparation for 2D surface seismic surveys of the Upper and Lower Pits. Field work was performed by Mr. Walt Grinyer, P.G. of Geosyntec and Mr. Jim Hasbrouck, G.P. of Hasbrouck Geophysics, Inc. The seismic report was prepared by Dr. Jim Finegan, P.G., C.Hg. and has been reviewed by Mr. Sam Williams, P.G., C.Hg. of Geosyntec Consultants (Geosyntec), in accordance with the review policies of the firm. 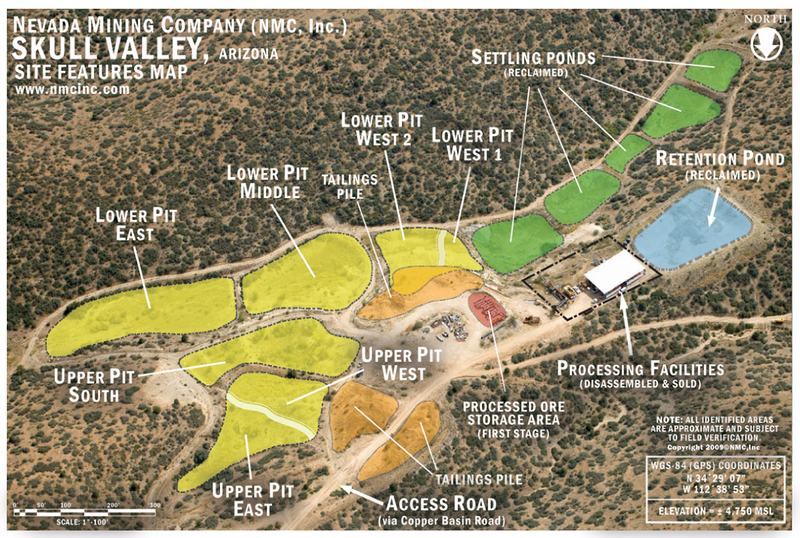 This data was used to calculate estimated volumes of the Skull Valley concentrates within each pit. 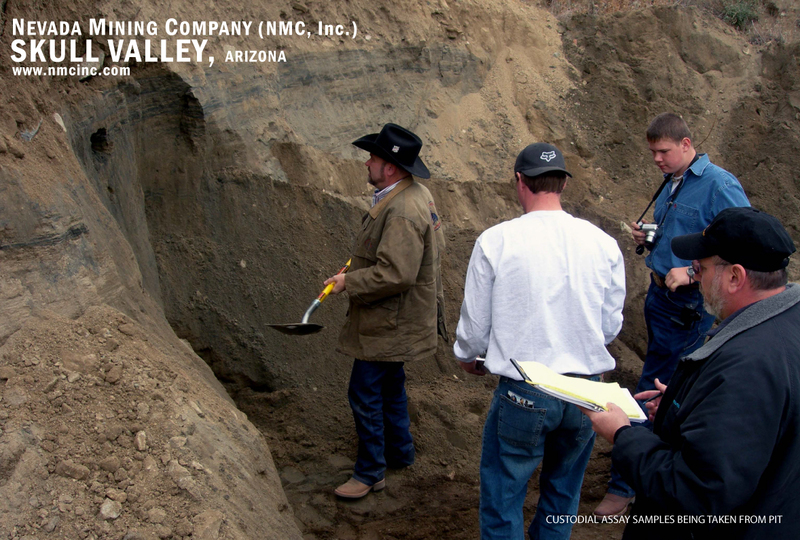 The following is a summary of the volume and tonnage in situ at Skull Valley. * Tonnage was calculated assuming 1.4 tons per cubic yard, based on historical documents. ** This pit was not seismically surveyed; the indicated depth is based on recent excavation and the outline was estimated by visual assessment of the aerial photograph; both should be field confirmed.